Are you a fan of Mass Effect 3's art? How about extra downloadable content? We've known for a while that Dark Horse Comics would be publishing a Mass Effect art book appropriately titled The Art Of The Mass Effect Universe, but as of this morning the Milwaukie, Oregon-based comics firm has also revealed that the digital version of the tome will include codes to unlock DLC content in the PC and Xbox 360 iterations of Mass Effect 3. BioWare, a label of Electronic Arts, Inc., and Dark Horse Comics revealed today that fans who purchase the digital version of The Art of the Mass Effect Universe through Digital.DarkHorse.com will receive a limited code to unlock a Reinforcement Pack containing in-game items to be used on PC or the Xbox 360 video game and entertainment system in the co-op campaign in 2012's most anticipated game, Mass Effect 3. Showcasing the unique and iconic art featured in the Mass Effect series, The Art of the Mass Effect Universe was released in print and digitally on February 8. 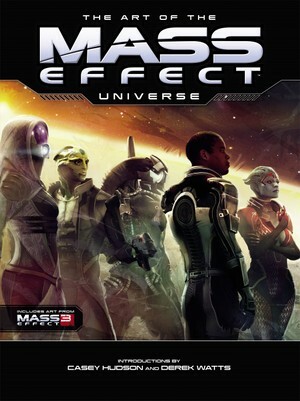 Additionally, Mass Effect fans who purchase the digital version of the four-issue comic miniseries Mass Effect: Invasion at the Dark Horse Digital store will also receive a limited code to unlock a Reinforcement Pack. Fans who gain access to the Reinforcement Packs will receive in-game items that can be used in the four-player cooperative multiplayer campaign in Mass Effect 3 on PC or Xbox 360. These packs will include powerful character boosters and the devastatingly lethal Collector Assault Rifle. If you're suddenly in need of this art book, you can visit Dark Horse Digital and plunk down $25 for a copy. Unless you're too busy being upset about the end of Mass Effect 3. That's cool too, I guess.